We have changed our number to a new service. We are now using Google Voice. You may also reach us at orders@betterwpd.com or by sending a message through the website. Shipping on the website reflects ONLY shipping prices within the continental US. 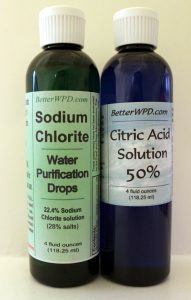 Sodium Chlorite must be shipped via UPS Ground ONLY. All orders that are located outside the US: You will receive a quote in an email. You need to reply to the mail within TWO WEEKS, or the order will be cancelled. Welcome to the new & improved website!